Information and Solutions for people, businesses and institutions involved in Food and Agriculture, specially in arid regions and developing world countries. Our civilization faces a great challenge: for the next 40 years we have to double the food output from our farms if we want the expected 9 billion people living then to be properly fed. If that was not challenging enough, let´s add the restricted availability of the key ingredient: water. Not only an issue of quantity, but of the environmental impact that would cause having to double the volume of water that we currently use in agriculture. Conclusion: we need to produce more (a lot more) with less (water among other inputs). Irrigation systems must become an indispensable and omnipresent actor in farms all across locations, like Africa and other underdeveloped regions, as much as it is today in the most advanced agricultural regions, like Europe and North America. Rain-fed crops are no longer an option for the assurance of food supply to 9 billion people. Irrigating crops by traditional inundation practice, isn´t either a sustainable option. Only systems like drip irrigation and spray are seen as a viable alternative that can ensure a great increase in output production while preserving the natural reserves of water. Efficiency of existing irrigation systems is big, but it´s expected that most evolved systems, like hydroponics, only implanted in the western world, do expand their presence and become the standard in those regions where today rain is the first irrigation system. 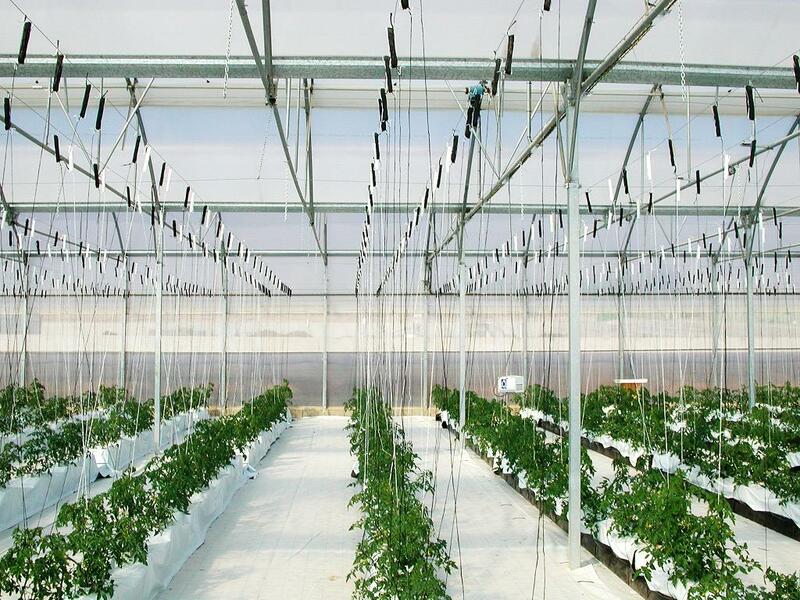 With systems that require an extraction of water equivalent only to that the plants incorporate to their cells, plus the loses on evapotranspiration, we ensure that only the strictly necessary water is used. Efficiency at top level. Greenhouses provide a big range of advantages to horticulture. Yet cereal crops are excluded, there´s still a big stake of the food diet that can be grown under protected environment. The protection from weather and pest risks, provides outstanding conditions to multiply the yield of all crops by several times the standard in outdoor conditions in the same surface; crops can be grown during a longer period of the year (even the whole of it in some cases); the losses of production due to quality damages are minimized; the demand of inputs like water, fertilizers and agrochemicals is lower per kg of product obtained; the use of pesticides can be minimized or eradicated much more easily than in outdoor crops. Add to all that the possibility to modify and control the interior climate conditions according to each crop, and the output is boosted. The combination of Greenhouses and modern Irrigation Systems represent a mix of highest efficiency, and as such, them should play a significant role in the development of a new model of sustainable agriculture in those regions of the planet, where current practices are completely unviable to ensure food supply in the coming decades. This is the video launched by AGROLUTION http://www.agrolution.com to introduce the range of services that provides for the development of agribusiness in Africa. I will transcribe here a very interesting article of Mr Calestous Juma, Professor of the Practice of International Development and Director of the Agricultural Innovation Project at Harvard Kennedy School, Harvard University, Author of The New Harvest: Agricultural Innovation in Africa1 (Oxford University Press, 2011). The article is a reflexion on the ideal definition and role that universities could and should play in the ignition of the huge potential that Africa agriculture has. I hope you find it exciting and interesting; your comments are more than welcome. Policy attention across Africa is shifting to fostering agricultural innovation through enhanced research support and entrepreneurship. This will require radical transformation of the system of higher agricultural education. The current separation between research in national institutes and education in universities is a major obstacle to innovation.This article proposes an alternative approach involving the creation of agricultural universities under the relevant line ministries. The seed for such universities already exist in the form of national agricultural, livestock and fisheries institutes which can be upgraded to combine research, teaching, extension and commercialization under one roof. Unlike existing universities, the new institutions would work closely with farmers and agribusiness which would be a source of ideas on curricula, pedagogy, choice of students and location. The African agricultural challengeIn sub-Saharan Africa, agriculture directly contributes to 34% of gross domestic product (GDP) and 64% of employment. Growth in agriculture is at least two to four times more effective in reducing poverty than other sectors. Growth in agriculture also stimulates productivity in other sectors such as food processing. Agricultural products also compose about 20% of Africa’s exports. Given these figures, it is no surprise that agricultural research and extension services can yield a 35% rate of return, and irrigation projects a 15–20% return in sub-Saharan Africa. Even before the global financial and fuel crises hit, hunger was increasing in Africa. In 1990, over 150 million Africans were hungry; as of 2008, the number had increased to nearly 250 million. Starting in 2004, the proportion of undernourished began increasing, reversing several decades of decline, prompting 100 million people to fall into poverty. One-third of people in sub-Saharan Africa are chronically hungry—many of whom are smallholder farmers. High food prices in local markets price out the poorer consumers—forcing them to purchase less food and less nutritious food, as well as to divert spending from education and health and to sell their assets. This hunger-weak agricultural sector cycle is self-perpetuating. Over the last 25 years, growth in agricultural GDP in Africa has averaged approximately 3% but has varied significantly among countries. Growth per capita, a proxy for farm income, was basically zero in the 1970s and negative from the 1980s into the 1990s. Six countries experienced negative per capita growth. Productivity has been basically stagnant over 40 years—despite significant growth in other regions, particularly Asia, thanks to the Green Revolution. Different explanations derive from a lack of political prioritization, underinvestment, and ineffective policies. The financial crisis has exacerbated this underinvestment, as borrowing externally has become more expensive, credit is less accessible, and foreign direct investment has declined. 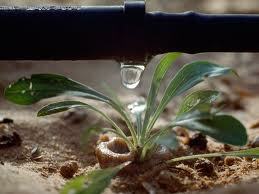 Only 4% of Africa’s crop area is irrigated, compared to 39% in South Asia. Much of rural Africa lacks passable roads, translating to high transportation costs and trade barriers. Cropland per agricultural population has been decreasing for decades. Soil infertility is a result of degradation: nearly 75% of the farmland is affected by the excessive extraction of soil nutrients. Fertilizer use in Africa is less than 10% of the world average of 100 kg. Just five countries (Ethiopia, Kenya, Nigeria, South Africa, and Zimbabwe) account for about two-thirds of the fertilizer consumed in Africa. On the average, sub-Saharan African farmers use 13 kg of nutrients per hectare of arable and permanent cropland, whereas the rate in the Middle East and North Africa is 71 kg. Part of the reason why fertilizer usage is so low is because of the high costs of imports and transportation: fertilizer in Africa is two to six times the average world price. This results in low usage of improved seed: as of 2000, about 24% of the cereal-growing area used improved varieties, compared to 85% in East Asia and the Pacific. As of 2005, 70% of wheat crop area and 40% of maize crop area used improved seeds, a significant improvement. Addressing these challenges will require considerable investment in agricultural science, technology and engineering. The challenge for Africa is developing appropriate institutional arrangements through which existing scientific and technical knowledge can be transmitted from research facilities to farms. Such institutional innovation could form a basis for renewed cooperation between Nordic countries and Africa. The challenges facing African agriculture will require fundamental changes in the way universities train their students. It is notable that most African universities do not specifically train agriculture students to work on farms in the same way medical schools train students to work in hospitals. Part of the problem arises from the traditional separation between research and teaching—the former is carried out in national research institutes and the latter in universities. National Agricultural Research Institutes (NARIs) operate a large number of research programs that provide a strong basis for building new initiatives aimed at upgrading their innovative capabilities. In effect, what is needed is to strengthen the educational, commercialization, and extension functions of the NARIs. More specifically, clustering these functions would result in dedicated research universities whose curriculum would be modeled along full value chains of specific commodities. For example, innovation universities located in proximity to coffee production sites should develop expertise in the entire value chain of the industry. This could be applied to other crops as well as to livestock and fisheries. Such dedicated universities would not have a monopoly over specific crops but should serve as opportunities for learning how to connect higher education to the productive sector. The new universities need to improve their curricula to make them relevant to the communities in which they are located. More important, they should serve as critical hubs in local innovation systems or clusters. The recent decision by Moi University in western Kenya to acquire an abandoned textile mill and revive it for teaching purposes is an example of such an opportunity. Such connections can be fostered without owning the facilities. Many of the NARIs are located in the proximity of a wide range of productive facilities with which they can foster long-term working relations. They can also branch into new knowledge-based fields. For example, NARIs located close to breweries can build up expertise in biotechnology using fermentation knowledge as a foundation. Similar arrangements can be created with other agro-based industries such as sugar mills and fish factories. Many models show how to focus on agricultural training as a way to improve practical farming activities. Ministries of agriculture and farming enterprises in African countries should create entrepreneurial universities, polytechnics, and vocational schools that address agricultural challenges. Such institutions could link up with counterparts in developed or emerging economies as well as institutions providing venture capital and start to serve as incubators of rural enterprises. Establishing such institutions will require reforming the curriculum, improving pedagogy, and granting greater management autonomy. They should be guided by the curiosity, creativity, and risk-taking inclination of farmers. The tasks laid out above will take considerable dedication, courage and commitment. Such efforts need to be recognized and rewarded. One way to do so is to institute Agricultural Innovation Prizes for outstanding contributions to strengthening agricultural research in African countries. The prizes would recognize achievements in research, teaching, commercialization and extension. Over the last decade considerable work has been done to redefine the role of government in agricultural research, decentralize research activities, increase stakeholder participation, identify new financial instruments, and strengthen system-wide linkages. These measures have been purposed on an incremental basis. They have indeed yielded commendable results. The next challenge, however, is to build on these achievements and pursue bold steps aimed at upgrading the status and performance of agricultural institutes by creating genuine innovation systems that involve research, training, extension, and commercialization. Top 5 Investment Opportunities In Africa For 2012 – Forbes. Information Technology and Rural Development. Interesting case in Kenya. Hello, I´m going to show you today a very interesting initiative set up in Kenya, where basic economic principles in alliance with basic ICT (information and communication technology) are providing a highly valuable and useful service for small farmers disseminated all over Kenya, and now extending to other neighboring countries. KACE (Kenya Agricultural Commodity Exchange) has developed a marketing information and linkage system (MILS) designed to facilitate competitive and efficient trade in agricultural commodities and services in Kenya, with the aim and potential for scaling out in the East African Community region. Through MILS, KACE collects, updates, analyses and provides reliable and timely marketing information and intelligence on a wide range of crop and livestock commodities, targeting actors in commodity value chains, with particular attention to smallholder farmers and small scale agribusinesses. The information includes daily wholesale buying prices for various crop and livestock products in selected main markets in the country, as well as commodity offers to sell and bids to buy. KACE also links farmers and agribusinesses to markets through matching commodity offers and bids. Market information enhances the bargaining power of the farmer for a better price in the market place, and helps to link the farmer to input and output markets more efficiently and profitably. As simple as that… Well, with the help of two easily accessible communication instruments: FM radio and SMS on mobile phones. Soko Hewani involves using a radio programme to match offers to sell or lease, or bids to buy or rent agricultural and any other commodities, properties and services compiled by the KACE.Target agricultural commodities include maize, rice, wheat, millet, sorghum, beans, tomatoes, cabbages, onions, carrots, fruits, potatoes, bananas, cattle, sheep, goats, camels, chicken, turkeys, eggs, milk, fish, honey, seeds and fertilizers. Target properties include houses, offices, vehicles and land. Target services include processing, packaging, transport for commodities, storage / warehousing, grading, quality testing and finance. The SMS service applies mobile telephony for market information delivery to users. The market information currently available includes daily wholesale buying prices for about 20 commodities, as well as offers to sell and bids to buy. Farmers, agribusinesses and other interested users who are mobile phone network subscribers download KACE market information as SMS messages. To know more about this very intelligent strategy watch the attached video or visit KACE website: http://www.kacekenya.co.ke. Congratulations for so much wise initiative. It´s a enormous pleasure to welcome you to the Innovating Agribusiness Blog. This, the first post, it´s obviously dedicated to the introduction of myself and the blog. My name is José María Montalbán, though I thought that using a nick name could ease interaction with followers. Yes, my real name is a bit too long and complex. In some situations, when giving it to someone, I got back: “Sorry, did you say Mon-Taleban?”. That´s why I chose Jose Monty as my public name. I´m a spanish Agronomy Engineer, consultant and entrepeneur in Agribusiness, this is, anything related to businesses involved within the food and agricultural industry. More specifically, my 20 years of experience now, have run around the fresh fruits and vegetable sector and the modern horticulture. Along all this time I had the opportunity to attend both, technical and managerial positions, in some reputed companies, and afterwards, work as a freelance consultant. This helped me to build a very broad vision and understanding of the complexities of this exciting business. Moreover, I was lucky to have the chance of doing all this in an International environment, which makes it more enriching, professionally speaking. Lately, my experience have become specialized in the Arab Gulf region, where I discovered the huge potencial for the fresh produce industry, despite the apparently harsh conditions of Nature there. For that reason, I´m currently undertaking some investments and business ventures in the region. My latest business project, AGROLUTION, is a company with the misión to serve all people, businesses and insitutions linked to the Fresh Produce World, by providing all kinds of Solutions, being these either goods or services. Agrolution is open to the world and specially to places most needed of support and assistance in the fostering of agriculture and food production, like extreme climate areas and developing countries. So, around all that matter, I shall ellaborate content and collect information to be published in this blog, with the aim to make it useful and available to as many people as possible. To make it even more valuable, you will also find here contributions of other experts and collaborators. If you are a farmer, student, teacher, investor, businessman, official, trader, scientist, NGO, association, or any other agent type involved in Agribusiness, just follow this blog to obtain valuable information of your interest. Thanks in advance for following.